An imposing online presence has become an essential requirement of almost every business, regardless of the product or service it sells. This presence is needed to consistently pull in new customers that help build and grow the business. Search Engine Optimization (SEO) is a potent tool that is used for enhancing visibility of websites and getting them found by the online prospects. SEO can be the most effective element of your online marketing program, bringing your business long-term growth. Search engine optimization gives your Seattle, WA business a permanent web presence unlike other internet marketing methods like PPC ads that stop bringing traffic the instant you stop paying. Continuously evolving SEO service from iLocal, Inc. can get your business website ranked high as a quality site. As your SEO service provider, we get personally involved in the success of your business. Our search engine optimization campaigns are targeted at strengthening your online existence and bringing an explosive growth in the hits, leads and conversions at your website. We see the degree of improvement in your website ranking, online sales and ROI as a comment on our SEO expertise. Contact us to learn more about our Seattle search engine optimization programs. Visit iLocal, Inc. today at 92 Lenora St Seattle, WA 98121! Another thing you will absolutely love about our SEO service is our affordable rates. We offer competitively priced search engine optimization packages engineered for different business models and needs. 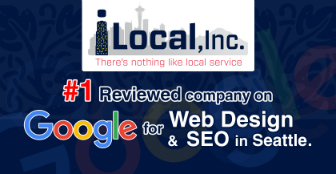 If you are looking for SEO service in Seattle that is completely focused on your success, visit iLocal, Inc. or call (206) 384-4344.